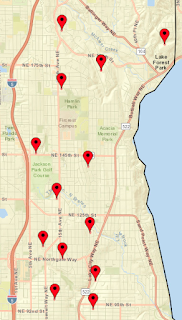 As of 9:53pm Wednesday, Seattle City Light had only 16 outages in its entire service area. 13 of them are on this map. 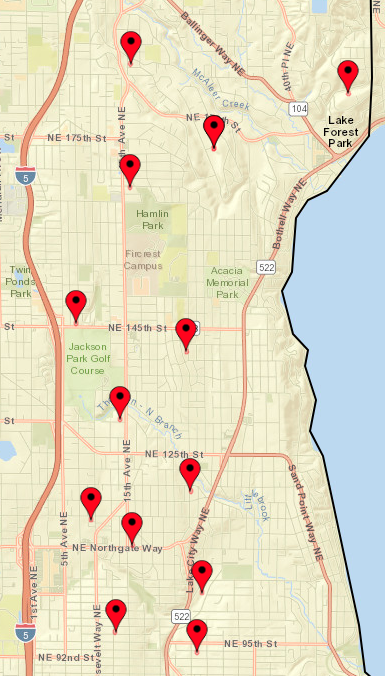 Each red dot represents one customer without power. City Light expected to have the lights back on by midnight Wednesday. We're reaching the end and starting to get back to normal. Cities are plowing secondary and tertiary routes. Small neighborhood streets are still a hazard. I'm hearing stories of people stuck on their own block, trying to get to work. A post office van slid and ended up in a front yard. Vehicles were abandoned where they got stuck. People whose roads were plowed had to dig out their driveways, which were blocked by huge dirty blocks of frozen ice and snow. City public works crews were weary from working 12 hour shifts in difficult terrain and snow. 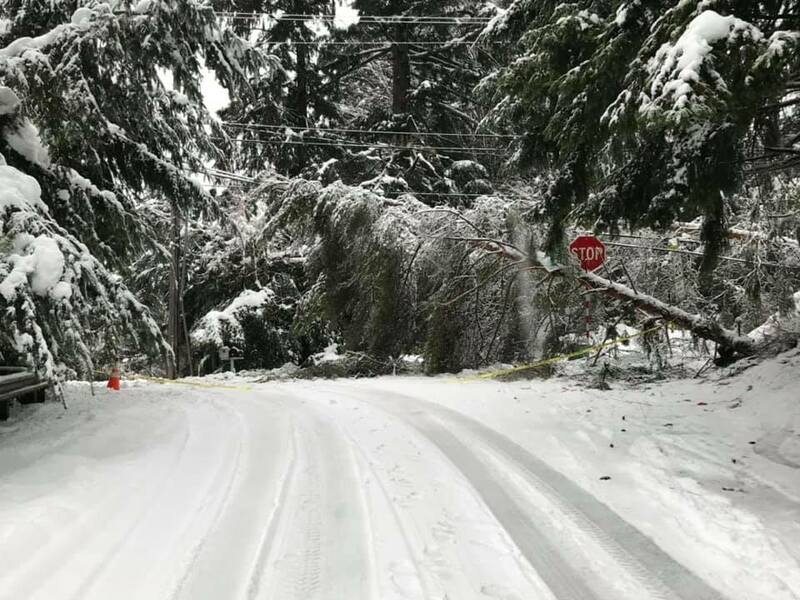 Seattle City Light crews had to deal with downed trees and blown transformers as well as long hours and very challenging working conditions. Trees came down across roadways and branches fell on roofs. People are wondering how much damage was done to their houses and looking for arborists. Events were disrupted and now everyone is trying to reschedule and let everyone know about the changed dates. Not much garbage was picked up. People with Monday and Tuesday collection dates are two weeks behind. Recology set up a garbage collection site at Hamlin Park for those two collection days. 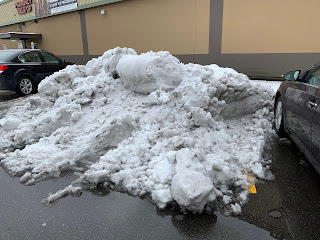 Fred Meyer plowed their parking lot. This pile of snow and ice may be on site for a while.